The Benholm Group is an established plantscaping organisation who work with many interior designers, architects and workplace professionals. They creatively bring plants and greenery into projects to support the principles of Biophilic Design. Whilst there is so much more to Biophilic Design than just plants and greenery, these are key elements to a successful scheme. How does Biophilic Design benefit us? Why is Biophilic Design trending now? 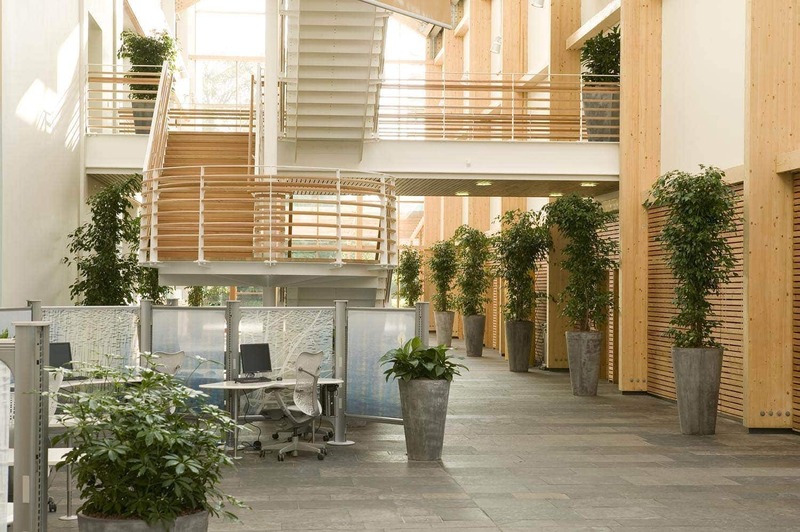 How can we apply Biophilic Design to Offices? This term derives from the word Biophilia which literally means a love of life. It stems from the Greek words for Life (Bios) and Love (Philia). The results show that we can achieve huge benefits if we include these design principles in the creation of our workplaces. Most importantly, there are significant negative impacts if we don’t! Those who work in office environments with natural elements such as greenery and sunlight report a 15% higher level of well-being. As a result, they are 6% more productive and are 15% more creative than those who work in environments devoid of nature. Those who enter an office space which incorporates nature are more likely to feel happy and motivated for the day ahead. Across the world, a third (33%) of all respondents report that the design of an office would affect their decision to work for that organization. This presents Biophilic Design as an important consideration for those companies that want to attract and recruit the best employees. Existing literature suggests that nature contact has a restorative effect on people. It helps them deal with day-to-day stress and work to maintain performance. Biophilic Design is about ensuring that our inherent requirement for contact with the natural environment is recognised and incorporated into our built environments. Whilst the term is not new, it has become established in the architecture and design world. It is fast becoming recognised by owners and managers of most organisations globally. Buildings, materials, products and systems have all gone through a lot of change over recent years to make them more environmentally friendly and sustainable. However, whilst this is good for the environment we live in, it does not really consider the human element. It helps protect the environment but doesn’t necessarily bring us into any greater contact with it. A project that has included this design process will produce a building that is not only “sustainable” and “eco-friendly” but it will also be “people-friendly”. It is important for organisations to position themselves appropriately in today’s competitive market. Why? To attract top talent and also retain existing experienced talent. So, we need to provide a workplace that incorporates Biophilic Design. This will contribute to ensuring the workplace is as productive and profitable as possible. Several leading organizations are now providing employees with contact with nature. Well-known examples include Google, Amazon, etc. There are many smaller organisations around the globe too. In addition to the well-researched and tangible benefits, this competition presents a further call to action for employers to consider the environments they create. There are many ways that we can apply Biophilic Design to an existing office environment as well as a new or refurbished office project. It can be implemented at different scales from almost no cost and virtually no disruption to a more significant with a high cost. Yet any implementation, providing it is well planned and implemented, can be expected to have a beneficial effect and a good ROI. The guide “Creating Positive Spaces using Biophilic Design”, which was published in June 2018, provides a very useful framework of ideas and suggestions across a very varied range of solutions. This is a very easy to follow guide and is based on the “14 Patterns of Biophilic Design”. It gives a wide range of practical ways to implement Biophilic Design to both interior and exterior environments. As mentioned above, plants and greenery are just one element of Biophilic Design. However, plants are a very fundamental and economical element. As Biophilic Design is really a journey, this is a great place to start! 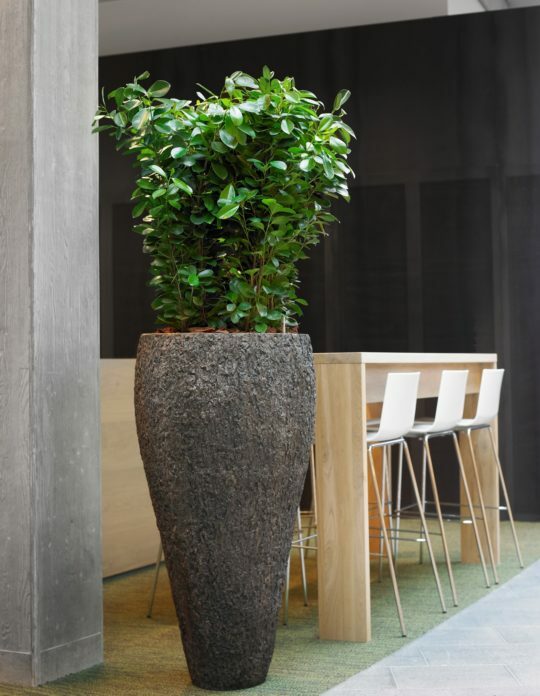 Plants come in many forms from small pot plants to huge feature green walls. These can include live, artificial or preserved foliage. Help with designing the planting to suit the space and specifying the right types of plants, is readily available from the Benholm Group. Purchase or rental options are available to suit any budget. They also offer a comprehensive ongoing maintenance service. This will ensure the planting always stays healthy and attractive providing complete peace of mind.